Recorded with a multitude of collaborators in Europe, Japan, Australia and the USA, Quixotism presents the fruit of two years of work in the form of a single, LP-length piece in five parts. Ambarchi’s work in recent years has evinced an increasing fascination with the possibilities of combining abstract sonic textures with rhythm and pulse, whether in his drumming with Keiji Haino, the subtly driving ride cymbals provided by drummer Joe Talia in their work together, or the motorik grooves of Sagittarian Domain (Editions Mego, 2012). Quixotism takes this aspect of Ambarchi’s recent work to the next level: the entirety of this long-form work is built on a foundation of pulsing double-time electronic percussion provided by Thomas Brinkmann. Beginning as almost subliminal propulsion behind cavernous orchestral textures and John Tilbury’s delicate piano interjections, the percussive elements (elaborated on by Ambarchi and Matt Chamberlain) slowly inch into the foreground of the piece before suddenly breaking out into a polyrhythmic shuffle around the halfway mark, being joined by master Japanese tabla player U-zhaan for the piece’s final, beautiful, passages. The pulse acts as thread leading the listener though a heterogeneous variety of acoustic spaces, from the concert hall in which the Icelandic Symphony Orchestra were recorded to the intimacy of Crys Cole’s contact-mic textures. Ambarchi’s guitar itself ranges over this wide variety of acoustic spaces, from airless, clipped tones to swirling, reverberated fog. Within the complex web Ambarchi spins over the piece’s steadily pulsing foundation, elements approach and recede, appear and reappear, in a non-linear fashion, even as the piece plots an overall course from the grey, almost Nono-esque reverberated space of its opening section to the crisp foreground presence of Jim O’Rourke’s synth and Evyind Kang’s strings in its final moments. Formally indebted to the side-long workouts of classic Cologne techno, the long-form works of composers such as Eliane Radigue, and the organic push and pull of improvised performance, Quixotism is constantly in motion, yet its transitions happen slowly and steadily, so that they are often nearly imperceptible, the diverse elements which make up the piece succeeding one another with the logic of a dream. Anyone who follows Ambarchi’s work knows that it has many facets: explorations of the outer limits of rock with Keiji Haino, psychoacoustic interference and sizzling harmonics in his solo performances, delicate improvisations with Keith Rowe or John Tilbury. To all these projects, Ambarchi brings his particular sensibility, patiently allowing sounds to develop on their own terms without forsaking their intrinsic physical and emotional power. 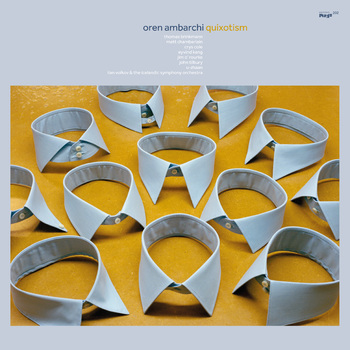 Similarly, although Quixotism is shaped by its many contributors, the resulting sound world is unmistakably Ambarchi’s own. His most substantial solo release since Audience of One (Touch, 2012), Quixotism represents the summation of Ambarchi’s work over the last few years while also pointing to the future.